If you have any questions or special whises please contact us. 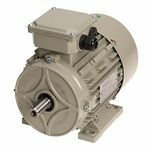 Our asynchronous motors in the efficiency class IE3 are also suitable for use with frequency inverters. Due to their high robustness and durability, the motors are suitable for use in heavy industry.